No, not for my painting! Settle down. For a haiku. "For a chance to win this print by Keizaburo Matsuzaki tweet us a Japanese memory or inspiration." The print is by Keizaburo Matsuzaki from Arakawa-ku, Tokyo, who made it while he was in the Gallery of NSW. It is a reproduction of Kitagawa Utamaro's print design of Takashima Ohisa. 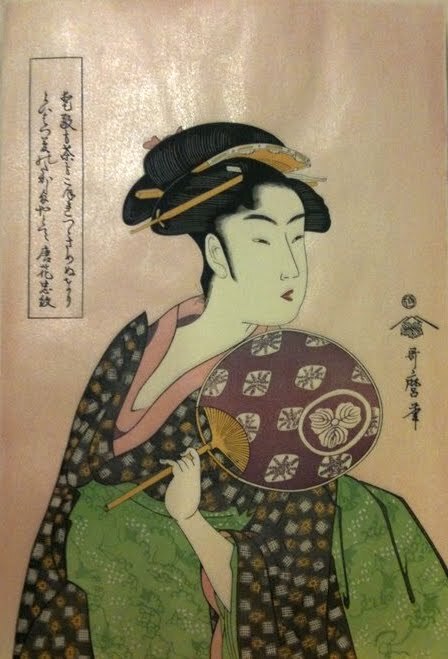 Matsuzaki was visiting the Gallery to demonstrate the art of complex woodblock prints to celebrate the Gallery’s current exhibition “Hymn to Beauty: the art of Utamaro” http://www.artgallery.nsw.gov.au/exhibitions/current/hymn_to_beauty . So, much excitement today as my hand-printed prize from the Gallery of NSW, http://img3.yfrog.com/img3/8743/xh4v.jpg , finally arrived. Thanks Molly Waugh and thanks Gallery of NSW.